The 2015 Infiniti Q50 poses a strong threat to the BMW 3 Series and the Audi A4. Equipped with a powerful V-6 engine and a nimble chassis, the Q50 promises to deliver an impressive driving experience. Not only does the sports sedan flaunt a five-star safety rating, but it also offers several high-tech safety features. On the inside, an extremely luxurious interior keeps the passengers comforted. Due to the fact that the current version was just introduced last year, only a minimum amount of changes have been made for the 2015 model year. However, prospective buyers now have the option of upgrading to a set of 19-inch performance wheels. 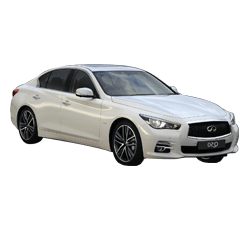 The 2015 Infiniti Q50 looks far more attractive than the average family sedan. The car’s sleek design gives it the appearance of a four-door coupe. While the standard wheels get the job done, the optional RAYS wheels take the Q50’s curb appeal to another level. All trims come equipped with a 3.7-liter, V-6 engine. The beefy engine is able to push out a muscular 328 horsepower. During performance testing, the speedy sedan was able to zip to 60 mph in only 5.5 seconds. A quick-shifting, seven-speed automatic transmission comes standard. Surprisingly, the Infiniti Q50 is able to deliver good fuel efficiency. When traveling on the open road, expect to average about 30 mpg. This is exciting news for the drivers who are concerned about the fluctuating cost of fuel. The hybrid version of the Infiniti Q50 is an engineering masterpiece. With a gas mileage rating of 29 mpg in the city and 36 mpg on the highway, the Q50 Hybrid promises to deliver a great balance of efficiency and power. In fact, the hybrid engine produces a jaw-dropping 360 horsepower. Even the base model comes standard with a rear-view camera system and Infiniti’s roadside assistance system. Features such as the blind-spot monitoring system gives the driver an extra degree of protection. Some of the other high-tech safety features include an Active Lane Control system, parking sensors, and a collision warning system. The Q50 is a very impressive performer on the road. While most drivers will be pleased with the standard suspension system, the optional sports-tuned suspension system is a must for true driving enthusiasts. The sedan’s athletic driving dynamics make it an excellent alternative to a traditional sports car. In regards to interior room, families will find the Q50 to be very accommodating. The trunk measures out at about 13.5 cubic feet, which should suit the needs of most drivers. While some owners will use their Q50 as a daily-driver, the sedan also proves to be a great long-distance cruiser. Plenty of luxurious features can be found on the 2015 Infiniti Q50. Some of the standard creature comforts include LED headlights, key-less ignition, and Infiniti’s proven InTouch infotainment system. There is also a long list of optional features, including an exclusive multi-view camera system and a high-end Bose audio system. Infiniti offers one of the most innovative steering systems on the market. The Direct Adaptive Steering system gives the driver excellent feedback. Unlike most steering systems, the Direct Adaptive Steering system is able to automatically make adjustments according to the current road conditions. While the Q50 comes standard with a rear-wheel-drive system, shoppers can also opt for an AWD system. The extra traction certainly comes in handy when traveling on wintry roads. Some car shoppers may find that the Infiniti Q50 is out of their price range. While a base model starts at about $38,000, the upper-level trims can cost more than $44,000. In comparison, regular family sedans such as the Toyota Camry can be purchased for less than $25,000. Although the Q50’s automatic transmission is exceptionally smooth, some drivers may still desire a manual transmission. Most people will love the engine’s raspy sound. On the other hand, there are others who will prefer a quieter performance. Some of the Infiniti’s rivals include the Audi A4, the BMW 3 Series, and the new Acura TLX. In terms of sheer performance, all of these sports sedans are on the same playing field. While the Q50 comes standard with a V-6 engine, the Audi and the BMW come with a boosted four-cylinder engine. Car shoppers who have grown tired of driving a typical family sedan should give the Q50 some consideration. The sedan’s excellent handling and outstanding safety rating make it a solid choice for families. While the hybrid model is a tad bit more expensive, it will reward the driver with great fuel efficiency.